Enamel demineralization/white spot lesions are one of the common adverse effects of fixed orthodontic appliance treatment. Due to morphological irregularity of fixed appliances, it creates favorable environment for microbial colonies. Wires play key role in demineralization process among various fixed orthodontic appliances due to their presence throughout the orthodontic treatment. Cleaning of tooth surface becomes difficult in contact areas between wires and brackets, thus providing favorable environment for plaque accumulation. With the emergence of antibiotic-resistant strain of bacteria, certain metals specifically in nanoparticle form have gained attention. Nanoparticles are insoluble particles having size smaller than 100 nm. Bacteria are less likely to show resistance to metal nanoparticles as compared to conventional antibiotics. Nanoparticles can be used either by combining with dental materials or by coating the surface which aims to decrease the microbial adhesion and prevent caries. Among the various metals, silver is known for its antimicrobial activity against Gram-positive and Gram-negative bacteria, fungi, protozoa, and certain viruses, including antibiotic-resistant strains. Because of such properties, silver is widely used in burned areas, medical devices, and textile fabric and as a water purifier. Various techniques have been tried to examine antimicrobial effects of silver metal. For such purpose, various techniques have been attempted for silver coating such as physical vapor deposition (PVD), electrodeposition, electroless deposition, and metallurgical. Certain silver thin films prepared by PVD method exhibit a strong antimicrobial effect as compared to others. In friction mechanics, tooth movement is achieved by guiding or “walking” a tooth along a continuous archwire with the use of a bracket. The friction that is generated at bracket-wire interface restricts tooth movement in the desired direction. For the clinicians practicing friction mechanics, it becomes necessary to understand the friction produced at bracket-wire interface in order to accelerate the tooth movement. Few studies ,,,, have concluded that silver-coated wires have antimicrobial and antiadherent properties. This silver coating may have effect on frictional property of SS wires. Knowing the frictional resistance of silver-coated stainless wires is essential for regular use of these wires in orthodontics for moving the teeth. Thus, the present study has been taken up to quantitatively assess the effect of silver coating on frictional resistance of SS wires. The study was carried out in the Department of Orthodontics, K. M. Shah Dental College and Hospital, Piparia, Vadodara, in collaboration with the Department of Applied Physics and Textile Engineering Department, Faculty of Technology and Engineering, M. S. University, Vadodara. The selection criteria included (1) 0.022 × 0.028” slots of McLaughin Bennett Trevisi (MBT) prescription central incisor brackets (Gemini series maxillary central incisor brackets, 3M, St Paul, United States); (2) 0.017 × 0.025” SS wires; and (3) 0.019 × 0.025” SS wires. Defective wires and brackets were excluded. The sample size was estimated using the sample size calculator, by which a sample size of forty wires was required to detect differences in frictional resistance values with a power of 80% and an alpha error rate of 5%, having a standard deviation of 34.04 and a clinically relevant difference (d) of 53. [Figure 1] illustrates the design of the study. [Table 1] describes groups of wires used for friction check. The instrument used for coating was HINDHIVAC (Hind High Vacuum Co., Bangalore) vacuum coating unit model no-15 F6. Vacuum Coater 15F6 produces thin, homogeneous, uniform, pure film coatings of various metals to achieve controlled effects in applications such as optics, electronics, materials, and thin film coating. 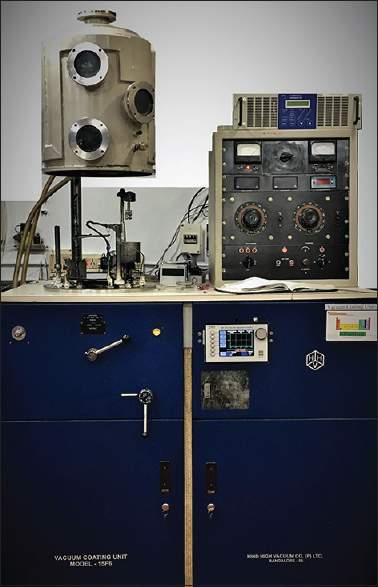 HINDHIVAC offers Vacuum-Coating Unit Model 15F6 with facilities for thermal evaporation, ion cleaning (bombardment), etc., with accessories for substrate heating, rotation, film-thickness monitoring, etc., Surface modification of SS wires in this study was carried out by thermal evaporation method [Figure 2]. Pure silver (99.9%) was used to obtain thin coating on orthodontic wire. The thickness was kept constant at 10 nm for all depositions and it was measured in situ using a quartz crystal thickness monitor. The argon (Ar) gas was used as a sputtering gas (7 sccm), whose flow was controlled by the mass flow controller (MFC, AALBORG, Germany). Direct current (DC) sputtering is a thin film PVD-coating technique where a target material to be used as the coating is bombarded with ionized gas molecules causing atoms to be “sputtered” off into the plasma. These vaporized atoms are then deposited when they condense as a thin film on the substrate to be coated., In this study, 40 W DC sputtering power and 10 milli torrent (m Torr) pressure were used. In this study, thickness of silver nanoparticle film is kept 10 nm to avoid any significant alteration in its dimension. Forty SS sheets were cut in the sizes of one-inch wide and one inch in length. The vertical and horizontal reference lines were drawn on the plate. Central incisor brackets were attached at the intersecting point of horizontal and vertical reference lines. The experimental procedure was carried out under dry conditions and at room temperature using a universal testing machine (UTM). The SS plate with the bracket was attached to the friction testing device. The SS plate with the bracket was fixed to the lower arm of UTM [Figure 3]. The straight part of the posterior segment of wire was cut up to 20 mm. This straight segment of each wire was then ligated to the bracket with elastomeric ligature. One end of the wire was fixed in the upper arm of UTM and the other end of the wire was placed in the slot and secured with elastomeric ligature. The load cell registered the force levels required to move the wire along the bracket; this level was then transmitted to a computer hard disk. The wires were moved on bracket at a crosshead speed of 0.5 mm/min. The unit for calculating load values of frictional resistance was Newton (N). After each test, the testing machine was stopped, the bracket-archwire combination was removed, and a new wire-bracket assembly was placed and tied with a new elastomeric ligature, and the frictional resistance was tested. A comparison of maximum load using one-way ANOVA test showed that the mean difference value (Unit: N-Newton) of Group 4 (2.56 N) was highest followed by Group 3 (1.55 N), Group 2 (1.46 N), and Group 1 (1.18 N) [Table 2] and [Table 3]. This difference was statistically significant with a test F = 17.80 (P = 0.029). Post hoc Tukey test showed that the difference between Group 1 and Group 2 was not statistically significant with a mean difference of −0.27 N (P = 0.854). The difference between Group 1 and Group 3 was not statistically significant with a mean difference of −0.37 N (P = 0.711). The difference between Group 1 and Group 4 was statistically significant with a mean difference of −1.38 N (P = 0.002). The difference between Group 2 and Group 3 was not statistically significant with a mean difference of −0.09 N (P = 0.993). The difference between Group 2 and Group 4 was statistically significant with a mean difference of −1.10 N (P = 0.017). The difference between Group 3 and Group 4 was statistically significant with a mean difference of −1.00 N (P = 0.032). From the time, when the symbiotic connection between S. mutans and L. acidophilus was first settled as causative factor for caries, various techniques have been attempted to counteract colonization of these microorganisms. At present, it is well established that the presence of S. mutans in oral cavity is responsible for caries initiation whereas L. acidophilus leads to caries progression. Different coating materials are being utilized as an anticipating measure to prevent bacterial adhesion. Among them, silver nanoparticles have pulled in consideration for their antibacterial and antifungal activities. Silver has been known to have such properties since centuries. As early as 1000 B. C., the antimicrobial properties of silver in rendering water consumable were admired. Silver particles have been in use for their restorative properties for a considerable length of time. Avicenna, in 980 AD, used and recommended silver as a blood purifier for heart palpitations and for hostile breath. Silver was incorporated with arsphenamine, for its antimicrobial properties. It was also utilized as a part of syphilis treatment in the twentieth century. Latest studies have shown positive results for surface modification of SS wires and brackets treated with photocatalytic titanium dioxide (TiO2) and titanium silver (TiAg). However, TiO2 coating can result in change in color of wires and brackets, and if coating on nickel–titanium wires is done, heating them at 500°C for 5 h is not desirable as it may bring in loss of its properties. The mechanism of action of silver involves interaction of silver with thiol groups in enzymes and proteins. Other cellular components such as hydrogen bonding can also be involved in antimicrobial activity. Silver acts by binding to the key functional groups of enzymes. Silver causes release of K+ ions from bacterial plasma or cytoplasmic membrane, which is a site related with many important bacterial enzymes. This makes it an efficient target site for silver action and to carry out its antibacterial action and other properties. In an investigation done by Mhaske et al., it was demonstrated that silver-covered wires have viable antibacterial and antiadherent properties against L. acidophilus. These outcomes suggested that silver nanoparticles can be extremely successful in controlling L. acidophilus and therefore reducing the caries progress. Decreasing the size of silver in nanoparticle shape is a basic condition for the powerful activity of silver. Smaller size particles give higher surface-to-volume ratio, causing more close interaction with microbial membrane and large surface zone for antimicrobial action. Dry conditions were used for assessing frictional coefficient in the current study. There are controversies among different investigators regarding the effects of the simulation of intraoral lubrication. Few studies claimed that wet conditions were ineffective on several materials., Another study has reported that the use of artificial saliva led to increase in friction. For this reason, in this study, dry condition was chosen. In a research done by Kapur et al., it was reported that repetitions in using individual bracket-archwire assembly led to increased friction. For this reason, each bracket-archwire assembly in the current study was tested only once to avoid any increase in frictional forces caused by material wear. According to a study done by Gandini et al., the metal ligature produces less frictional force than elastomeric ligatures, though friction produced by metal ligature depends on the tying force between metal ligature and orthodontic archwire. Besides, metal ligature takes longer clinical chairside time in comparison to elastomeric ligatures. For such reasons, elastomeric modules were used in this study for securing archwires to brackets. The results of this study suggested that there was no statistically significant difference in frictional resistance between silver-coated and uncoated 0.017 × 0.025 inch SS wires but showed significantly less frictional resistance in silver-coated 0.019 × 0.025 inch SS wires compared to uncoated group. This can be due to the difference in the play of 0.017 × 0.025 inch (15.5 degree) and 0.019 × 0.025 inch (9.6 degree) SS wires in 0.022 × 0.028 inch MBT prescription slot. This reduced play in 0.019 × 0.025 inch SS wires plays a role in increasing frictional resistance. In our study, coated 0.019 × 0.025 inch SS wires have shown less frictional resistance than uncoated group suggesting beneficial use of silver coated SS wires in routine orthodontic practice. Literature shows that surface treatment reduces friction up to 46%. Studies confirmed improvement in frictional properties of archwires by modifying the surface., The research done by Burstone and Farzin-Nia showed that there was a reduction in friction for titanium molybdenum alloy (TMA) wire treated with ion implantation than untreated TMA and steel wires which support our findings. Concentration-dependent toxicity has been demonstrated with silver, and therefore, its use must be taken with caution. In the list of hazardous heavy metals to public health, silver has not been mentioned yet, but still accumulation of this metal particle in the environment should be contemplated. The amount of silver required for successfully carrying out antiadherent/antibacterial properties and the maximum lethal dose should be determined if its toxicity is to be avoided before it can be incorporated in orthodontic materials. The coating of silver particles is done only on the surface of wires and may be subjected to wear during archwire sliding. Assessing the properties such as durability and sustainability of silver coatings under clinical conditions in the oral environment is critical. Further studies are required in this concern. There was statistically significant reduction in frictional resistance observed in silver-coated 0.019 × 0.025 inch SS wires in comparison to uncoated wires. Overall silver coating either did not affect the frictional resistance (0.017 × 0.025 inch SS wires) or reduced it (0.019 × 0.025 inch coated SS wires) compared to uncoated wires. Findings suggest that the use of silver-coated SS wires in routine orthodontic practice can be implemented after further in vivo human clinical trials. The authors wish to thank Dr. Chetan Panchal of the Department of Applied Physics, M.S. University, Vadodara, for helping in silver-coating procedure. Balenseifen JW, Madonia JV. Study of dental plaque in orthodontic patients. J Dent Res 1970;49:320-4. Eliades T, Eliades G, Brantley WA. Microbial attachment on orthodontic appliances: I. Wettability and early pellicle formation on bracket materials. Am J Orthod Dentofacial Orthop 1995;108:351-60. Menzaghi N, Saletta M, Garattini G, Brambilla E, Strohmenger L. Changes in the yeast oral flora in patients in orthodontic treatment. Prev Assist Dent 1991;17:26-30. Chatterjee R, Kleinberg I. Effect of orthodontic band placement on the chemical composition of human incisor tooth plaque. Arch Oral Biol 1979;24:97-100. Rosenbloom RG, Tinanoff N. Salivary Streptococcus mutans levels in patients before, during, and after orthodontic treatment. Am J Orthod Dentofacial Orthop 1991;100:35-7. Scheie AA, Arneberg P, Krogstad O. Effect of orthodontic treatment on prevalence of Streptococcus mutans in plaque and saliva. Scand J Dent Res 1984;92:211-7. Mattingly JA, Sauer GJ, Yancey JM, Arnold RR. Enhancement of Streptococcus mutans colonization by direct bonded orthodontic appliances. J Dent Res 1983;62:1209-11. Ahn SJ, Lim BS, Lee SJ. Prevalence of cariogenic streptococci on incisor brackets detected by polymerase chain reaction. Am J Orthod Dentofacial Orthop 2007;131:736-41. Monteiro DR, Gorup LF, Takamiya AS, Ruvollo-Filho AC, de Camargo ER, Barbosa DB, et al. The growing importance of materials that prevent microbial adhesion: Antimicrobial effect of medical devices containing silver. Int J Antimicrob Agents 2009;34:103-10. Djokic SS, Burrell RE. Behavior of silver in physiologic solutions. J Electrochem Soc 1998;145:1426-30. Yamamoto K, Ohashi S, Aono M, Kokubo T, Yamada I, Yamauchi J, et al. Antibacterial activity of silver ions implanted in SiO2 filler on oral streptococci. Dent Mater 1996;12:227-9. Bednar JR, Gruendeman GW, Sandrik JL. A comparative study of frictional forces between orthodontic brackets and arch wires. Am J Orthod Dentofacial Orthop 1991;100:513-22. Hernández-Sierra JF, Ruiz F, Pena DC, Martínez-Gutiérrez F, Martínez AE, Guillén Ade J, et al. The antimicrobial sensitivity of Streptococcus mutans to nanoparticles of silver, zinc oxide, and gold. Nanomedicine 2008;4:237-40. Balazs DJ, Triandafillu K, Wood P, Chevolot Y, van Delden C, Harms H, et al. Inhibition of bacterial adhesion on PVC endotracheal tubes by RF-oxygen glow discharge, sodium hydroxide and silver nitrate treatments. Biomaterials 2004;25:2139-51. Mhaske AR, Shetty PC, Bhat NS, Ramachandra CS, Laxmikanth SM, Nagarahalli K, et al. 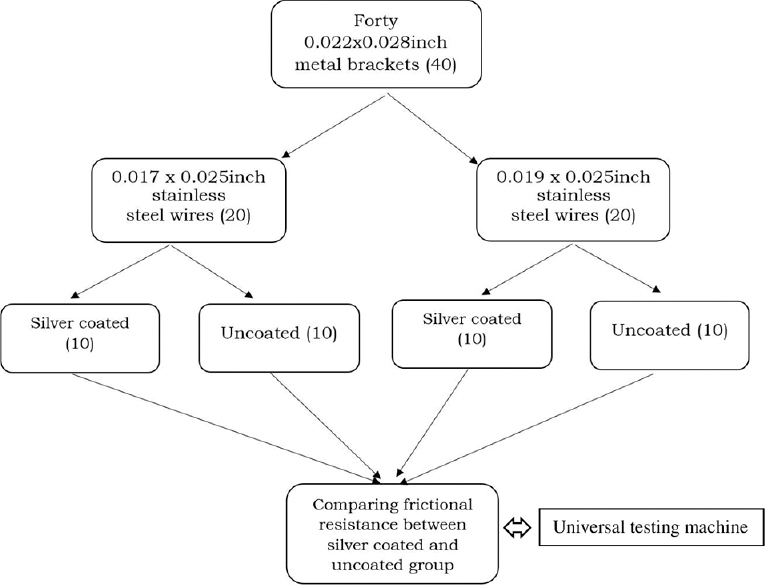 Antiadherent and antibacterial properties of stainless steel and NiTi orthodontic wires coated with silver against Lactobacillus acidophilus – An in vitro study. Prog Orthod 2015;16:40. Rajanikant RJ. High Efficiency Copper Indium Gallium Diselenide (CIGS) Thin Film Solar Cells. The Maharaja Sayajirao University of Baroda; 2013. Sesham VM, Jaitly A, Chigurupati L, Neela PK, Mamillapalli PK, Peddu R. Comparison of frictional resistance between various bracket types and archwire materials ligated with low-friction and conventional elastic ligatures. J NTR Univ Health Sci 2015;4:246-52. Kang MK, Moon SK, Kim KM, Kim KN. Antibacterial effect and cytocompatibility of Nano-structured TiO2 film containing cl. Dent Mater J 2011;30:790-8. Kang MK, Moon SK, Lee SB, Kim KM, Lee YK, Kim KN. Antibacterial effects and cytocompatibility of titanium anodized in sodium chloride, calcium acetate, and ß-glycerol phosphate disodium salt pentahydrate mixed solution. Thin Solid Films 2009;517:5390-3. Russell AD, Hugo WB. Antimicrobial activity and action of silver. Prog Med Chem 1994;31:351-70. Jung WK, Koo HC, Kim KW, Shin S, Kim SH, Park YH, et al. Antibacterial activity and mechanism of action of the silver ion in Staphylococcus aureus and Escherichia coli. Appl Environ Microbiol 2008;74:2171-8. Kusy RP, Whitley JQ. Influence of fluid media on the frictional coefficients in orthodontic sliding. Semin Orthod 2003;9:281-9. Pratten DH, Popli K, Germane N, Gunsolley JC. Frictional resistance of ceramic and stainless steel orthodontic brackets. Am J Orthod Dentofacial Orthop 1990;98:398-403. Stannard JG, Gau JM, Hanna MA. Comparative friction of orthodontic wires under dry and wet conditions. Am J Orthod 1986;89:485-91. Kapur R, Sinha PK, Nanda RS. Frictional resistance in orthodontic brackets with repeated use. Am J Orthod Dentofacial Orthop 1999;116:400-4. Gandini P, Orsi L, Bertoncini C, Massironi S, Franchi L. In vitro frictional forces generated by three different ligation methods. Angle Orthod 2008;78:917-21. Kim Y, Cha JY, Hwang CJ, Yu HS, Tahk SG. Comparison of frictional forces between aesthetic orthodontic coated wires and self-ligation brackets. Korean J Orthod 2014;157-67. Proffit WR, Fields HW, Sarvour DM. Contemporary Orthodontics. Ch 16. 4th ed. St. Louis, Mosby: The Third Stage of Comprehensive Treatment: Finishing; 2007. p. 607. Cacciafesta V, Sfondrini MF, Ricciardi A, Scribante A, Klersy C, Auricchio F, et al. Evaluation of friction of stainless steel and esthetic self-ligating brackets in various bracket-archwire combinations. Am J Orthod Dentofacial Orthop 2003;124:395-402. Husmann P, Bourauel C, Wessinger M, Jäger A. The frictional behavior of coated guiding archwires. J Orofac Orthop 2002;63:199-211. Burstone CJ, Farzin-Nia F. Production of low-friction and colored TMA by ion implantation. J Clin Orthod 1995;29:453-61.